I have been building flutes for a very long time… Living in a place like Wyoming brings a never ending stream of inspiration to draw from. Like my passion for photography I share an equal passion for building Native American Style flutes. I have spent many an hour working on commissioned base flutes trying to deliver an end product that hopefully meets or exceeds the buyer of my art. I fully enjoy the commissioned project experience but I just can’t stop wanting to build more. As I approach my 58th birthday this year I find myself once again seeking a change in what I do. Many who know me know that for the past 33 years I have been a health insurance broker with focus on the International Expat markets. This will continue to be part of my daily efforts but as for my website Jackson Hole Tim I want to be more proactive in my flute building efforts. Crafting one of these awesome wind instruments never get tiring. Although I have enjoyed the commission side of building flutes I prefer designing the flute, building it and then sharing it with others. I am pretty sure that I maintain the largest selection of Native American Style flutes here in the state of Wyoming. Every one of my flutes is hand made by me using mostly hand tools. That is just the way I do it. My inventories are finally starting to grow for the first time in a while. If you were to visit my farm gallery here in Afton Wyoming you would find a minimum 25+ flutes in various stages of the build with more on the way. I have over 100 blanks pre-cut and gluing up new ones weekly. By end of summer I may have as many as 40 or more to choose from. One of the nice things about how I build my flutes is that I work on many at a time so each one is in a different phase some from the glue the up stage to being a fully completed flute. Having a variety in different phases of construction allows you to pick one that stands out to you that may not be completely finished and this allows for my to still add some of you to the flute before delivery. My shop is now in Afton Wyoming and our little ranch is open to those who want to venture out and visit us. We are just a mile or so off of the main highway (HWY 89) and we very easy to find. Although we are home most of the time we do travel from time to time so call first. But feel free to stop by and check out the flutes I have available. We are open 9-5 Monday through Friday so reach out to me and stop by… I would love to meet you. Recently I announced I had selected 9 of my favorite images of Wyoming and the Yellowstone Basin to be made into folded Greeting Cards. Well the first order is now here ready to ship. This cards are 5×7 folded with a blank interior for your message and credits on the back. Each card ships with it’s own envelope for mailing. These are printed on a really nice card stock and the images are fairly impressive. Shop them now right here on Jacksonholetim.com. If you like what you see and you have a retail shop or Online business we want to talk to you. These greeting cards would be a great value add to your shop. If interested reach out to Tim Jennings at Sales@Jacksonholetim.com. We want to earn your business! Jackson Hole Tim Website Makes a Change! As long as I have lived in Wyoming I have made Native American Style flutes, Wyoming influenced one of a kind jewelry, custom fetish designs and I have built some amazing commissioned pipe projects. My view of Wyoming is also shared through my photography as I see it through the lens of a camera. It is these things that bring purpose and joy to my life and as with all things time seems to find a way to erode away at them. Jacksonholetim.com over time has become more of a store selling parts to others who seek the knowledge to build or learn to build the wind instrument known to most as the Native American Flute rather than a platform to share my art. I have spent countless hours crafting flute parts and sharing what took me years to learn which is to share the knowledge of how to build one of these fine instruments. I have enjoyed sharing what I have learned but now it;s time to get back to the genesis of all this. As I get older I find less and less time to actually do what it is I want… no feel called to do which is to be a builder of flutes, pipes and share my visions of Wyoming through the lens of a camera. As I approach 60 years of age I find that time is now my biggest enemy with less and less of it at hand. I want to go back to my craft and create flutes that others will find joy in playing. So from this post forward you will see a change in our menu choices and the elimination of flute parts, wood stocks and other flute making supplies and I will begin to focus back on creating, crafting and designing new projects for others. I am actively interviewing for new commissions for flute and pipe projects. Because of the time each commission project consumes I have a limit amount of project slots I can offer each year. If you want to open a dialog for a new project that I can do for you simply reach out and let’s talk. A couple of years ago I was commissioned to build a very special flute. I have made a post about this before but I wanted to update this article as there has been some very nice things take place this past summer directly related to this post. I completed the construction of a very nice flute for one of my favorite customers, Mary Blakeley, who lives in Idaho. This is one of the first flutes where I crafted the entire flute and fetish but did not put a finish on the flute prior to shipping. Mary wanted to complete this process for her flute on her own and I was excited to see what she has in mind. This flute was crafted from a very interesting piece of Sassafras. Sassafras is very nice wood to work with and I like the tonal qualities of this wood. Generally Sassafras is kind of non descriptive wood and it does not have the flash that other domestic species can have. This board was unusual because the grain patterns were very nice. The problem was – the board was twisted and bent and wow – I was not sure I would be able to make it work. After consulting with Mary she made the decision that this piece was the one for her so I agreed to go ahead and see what I could do. Because I liked the grain patterns so well I cut the best sections out of the board and spent two weeks trying various tricks to help straighten the blanks out. After a couple of weeks and several different methods I realized that I was going to have to simply do my best during the glue up phase and make sure I had enough clamps on the blanks and a good solid coat of glue to boot. Prior to glue up there were two things I needed to do. First Mary requested I write into the inside of the flute the name “GOD” in Paleo Hebrew which I did. I then sealed the name into the flute body and it is now part of this flute forever. Second, I scored the entire gluing surfaces by hand with a sharp blade to give us some extra bite for the glue. Prior to the glue up I inlaid a small piece of ironwood into the top of the flute. This inlay became the cutting edge on this flute and the contrast came out perfect. Then I clamped it up and as you can see we made sure we had enough on the blanks. We left the blanks in the clamps overnight to make sure we gave it ample drying time and later the next day we removed the clamps and the results could not have been better. 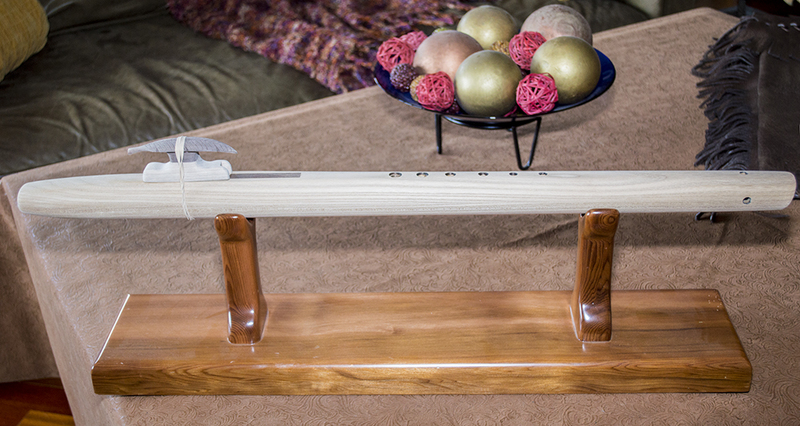 We wanted to shoot for a lower C# which made this a very long flute, almost 30 inches in length. 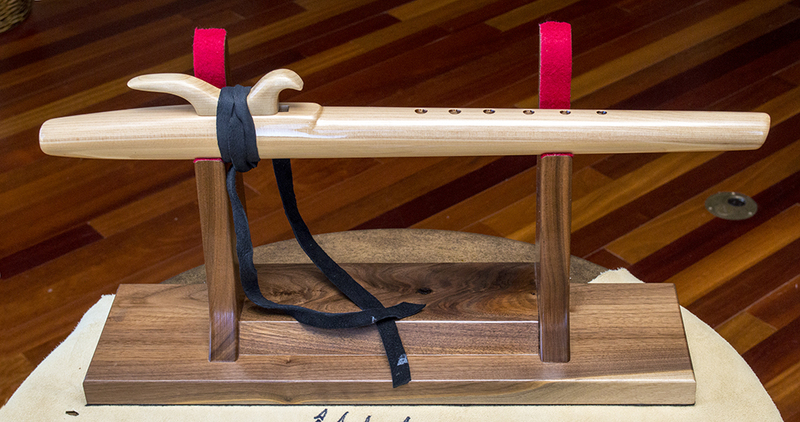 We used the four winds tuning holes and spent hours tuning the flute the best I could. A C# is just about at the outside abilities for a 1 inch bored flute. I was able to achieve the fundamental note and like all of our flutes I voiced it for the first time right here in Jackson Hole Wyoming, home of the Teton Mountain range. The fetish was one of my custom made whimsical feather designs that was crafted from a single piece old growth walnut with a band of sapwood in it. The base of the fetish is the sapwood and the feather is the black walnut color. A chimney was created to help with prevention of the #6 hole from jumping to easily and the results were pleasing. After many hours of frustration and several challenges that we were faced with this flute ended up being one my favorites that I have worked on in quite some time. Nothing came easy on this flute and there were several times where I thought it was going to end up in my fireplace. But with Mary’s constant coaxing and support this flute came out just beautiful. We shipped this flute to her some time ago and I awaited pictures from her once she had completed her finishing project. All in all a very nice project. UPDATE: Recently I received a package in the mail from Mary. It was long like a flute but I thought how could this be. I had recently crafted a new flute for her at her request out of a piece of Black Willow I had been saving. Mary had a vision that her next flute was to be an eagle flute and so this is what we came up with. Again this new flute was to be shipped with no finish on the wood as she would take care of this herself. Could this package I just received be this flute I had shipped to her earlier in the year? So I eagerly opened the package and to my surprise it was a flute but to my great relief it was not the flute below. After looking at it carefully I suddenly realized that is was the very flute this article was written about. Mary was returning it to me as a gift – one that I had never received before in all the flutes I have made for people. Mary wanted me to have this flute and to do something new and exciting with it. To be truthful I am not sure what exactly that is but I have this flute in front of me and I see it every day. I think of Mary most days and I think of all the flutes we have shared over the past few years. Mary has a gift, a gift of love and sharing the word of God. A very spiritual women she is and I thank God everyday for our chance meeting many years ago.